The Queen and Prince Philip have celebrated their 60th wedding anniversary with a service which featured a reading from Prince William. Prayers were said and the Archbishop of Canterbury asked the couple, in a blessing, to "renew in your hearts promises you made to one another". More than 30 family members were among 2,000 people at Westminster Abbey. Other guests included five choristers from the 1947 service, as well as 10 couples who married on the same day. 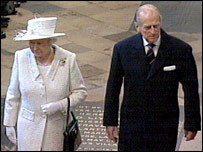 The service was also watched by Prime Minister Gordon Brown as well as his predecessors John Major and Baroness Thatcher. The Queen is the first British monarch to reach a diamond wedding anniversary. The Archbishop of Canterbury, Dr Rowan Williams, said in his sermon that every marriage was a public event but that "some couples have to live more than others in the full light of publicity". "We are probably more aware than ever these days of the pressures this brings," he said. "But it also means that we can give special thanks for the very public character of the witness and the sign offered to us by this marriage and what it has meant to nation and Commonwealth over the decades." During prayers, the congregation were asked to pray "for Her Majesty and His Royal Highness - for their life together as husband and wife". Prince William, in his reading of 1 John 4:7-16, told the congregation to "let us love one another, because love is from God". 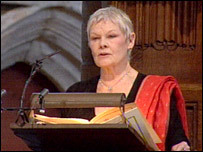 Dame Judi Dench read the poem Diamond Wedding - written especially for the occasion by poet laureate Andrew Motion - which speaks of "a life remote from ours because it asked each day, each action to be kept in view". There was also a procession of representatives from different religions including the Muslim, Jewish, Buddhist, Hindu and Sikh faiths. As was the case in 1947, a setting by EC Bairstow of Psalm 67 - God Be Merciful Unto Us And Bless Us - was sung by the abbey choir. Other elements that were at both ceremonies included the performance, at the start of the service, of We Wait For thy Loving Kindness O God, composed for the original ceremony by then-organist Dr William McKie. Similarly, the hymn The Lord's My Shepherd, set to the Scottish tune Crimond and chosen by the then-princess for her wedding, was sung. At the end of the service, Prince Philip and the Queen walked back up the aisle and met 10 couples who were also married on 20 November 1947. One of the couples, Margaret and Horace Bunn, both aged 80, from Ashington, Northumberland, said meeting the royal couple had been the "icing on the cake". Mr Bunn told BBC News: "We had a bit of an idea we might meet the Queen but we didn't know it was going to happen. "But, apparently, it was all planned and kept from us." His wife added: "We were really looking forward to meeting here and she was so nice." After the service, the royal couple met members of the public who came to Parliament Square to join the celebrations. On the square's Jubilee Walkway walking trail, the couple unveiled a panoramic panel - created to mark their anniversary - explaining landmarks on the London landscape. Royal family members turned out for a wedding anniversary dinner at Clarence House. The couple's actual 60th wedding anniversary is on Tuesday when they will travel to Malta where they lived as a young married couple from 1949 to 1951, while Prince Philip was stationed there as a serving Royal Naval officer. On Sunday, members of the Royal family attended a celebration dinner hosted by Prince Charles at Clarence House. The 1947 wedding, according to one of the couple's friends, was a moment of "blissful brightness and happiness" after World War II. The couple received gifts from around the world 60 years ago. These included a thoroughbred horse, 131 pairs of nylon stockings - a rare commodity at a time of rationing and austerity - and 500 tins of pineapple. However, BBC royal correspondent Peter Hunt says Mahatma Gandhi's present caught the disapproving eye of Queen Mary, Princess Elizabeth's grandmother. She told a friend the piece of hand-spun lace was "indelicate", mistaking the tray cover for the Indian leader's loincloth.